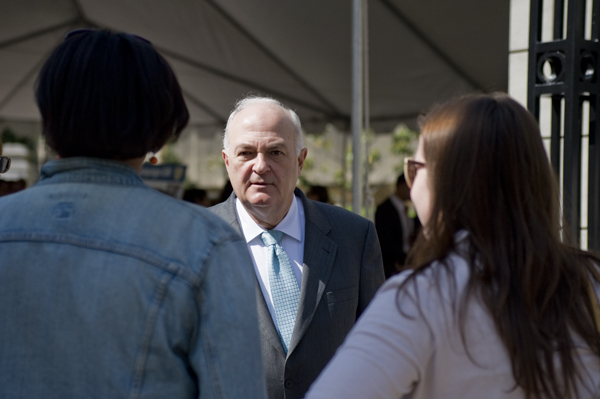 University President Steven Knapp greets students in person, but rarely interacts with them online. Knapp’s compensation – which includes bonuses and his on-campus residence, the F Street House – keeps him among the top few-dozen highest paid university presidents. His $761,496 salary, which does not include benefits, increased by 5 percent that fiscal year, which spanned the 2011 calendar year. His total compensation decreased slightly from the year before because the schedule for bonus payments changed, GW spokeswoman Candace Smith said. Historically, Knapp leads the pack among D.C. university presidents, outpacing Georgetown and American universities’ top leaders by tens of thousands of dollars. Many peer universities’ presidents, like those at New York, Boston, Northwestern and Vanderbilt, have also earned million-dollar salaries plus benefits. Knapp’s salary is a blip on the University’s total about $800 million operating budget. But his seven-figure compensation has caught students’ attention as loan debt piles up and tuition prices increase. 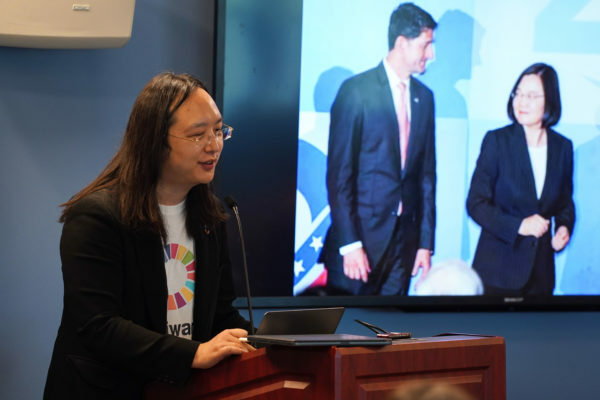 Since he came to GW from Johns Hopkins University six years ago, Knapp has drawn praise from faculty for increasing lab space and internal dollars for research. The Board of Trustees, too, has rewarded Knapp by extending his five-year contract two years ago. He added that one of the biggest challenges he has faced is getting “the message” out there in a “consistent” way. The Board, made up of 36 alumni, donors and business leaders, sets Knapp’s salary and bonus levels each year based on how he reaches the governing body’s goals, as well as what goals he sets for himself. 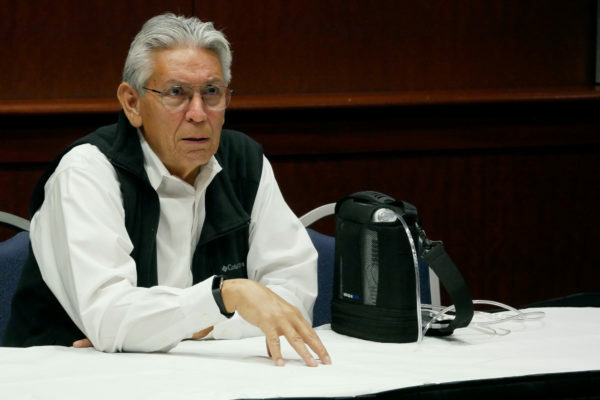 Increasingly, the Board is focusing on how Knapp reaches fundraising levels, Board of Trustees Vice Chairman Nelson Carbonell said. “We really want that incentive compensation to be real. We’re going to set aggressive goals. That’s part of the job,” said Carbonell, who will become chairman next month. Carbonell, who helped recruit Knapp from Johns Hopkins University in 2007, said overall the Board is “really happy” with how Knapp has done. The University has made a calculated push to build its donor base during Knapp’s administration, making it one of the central tasks of GW’s president. Historically, GW has much lower alumni giving rates than its peers, hurting how much the University can grow its bottom line. In fiscal year 2012, the University pulled in $120 million, the most money for a single year ever. However, the growth rate slowed to 6 percent – far lower than the previous year’s growth of more than 21 percent. The University has looked to incentivize GW’s top administrators to make stronger pitches to donors. Deans, colleges’ academic chiefs, now must spend 40 percent of their time fundraising, a sharp increase from before Knapp’s administration. Scott Jaschik, the editor of the website Inside Higher Ed, said private university presidents’ most important task is bringing in money. Executive Vice President and Treasurer Lou Katz said all administrators have some of their compensation “at risk,” depending on how they hit the University’s targets for their departments. Provost Steven Lerman also earned more than a half-million dollars, earning $749,555 last fiscal year. Lerman, the University’s second-in-command, oversees all academics, student life and admissions at the University. He was hired away from Massachusetts Institute of Technology in 2010, and also lives in University housing on the Mount Vernon Campus for free. For fiscal year 2012, Knapp wasn’t the highest earner. Former Senior Associate Provost John “Skip” Williams made $1,088,821, plus more than $41,000 in other benefits during the last year he was at the institution. Carbonell attributed the difference to a few one-time payouts that accumulate during an administrator’s tenure and are added in once an administrator leaves. The Hatchet incorrectly reported that the tax filings spanned the 2011-2012 academic year. They spanned the 2011 calendar year. The Hatchet also reported that Mike Morsberger and Steven Lerman saw big increases in compensation from the previous year. In fact, the filings from the prior year only showed partial salary levels because they had just been hired.